Please note: many of your payment and delivery questions will also be answered during the checkout process. 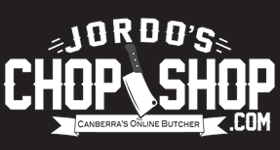 Jordo's Chop Shop will hand-deliver your order to anywhere in Canberra, Queanbeyan, Karabar, Jerrabomberra in our fully approved refrigerated transport.. The delivery charge is FREE for all orders $75 and over and a flat fee of $10 for orders under $75. Online orders close 4pm the day before and 4pm Thursday for Saturday (we prefer to order fresh stock daily). If you place your order after this time you can phone us on 62318755 and we'll tell you if we can fill your order based on stock available. All orders can be filled with minimal lead time, subject to stock availability (but obviously the more notice you give us the better). Customers who give us the most notice will always be given highest priority when allocating stock (first in best dressed). Please note that due to the perishable nature of the products sold by Jordo's Chop Shop, we cannot deliver to other areas. The exception to the above is our Australian Beef Jerky, merch and equipment, which we will ship Australia-wide. NOTE: we deliver to all ACT and Queanbeyan suburbs and CBD areas, sorry we do not deliver to surrounding NSW farms, towns, estates (sorry Murrambateman, Bywong, Yass etc.). If you work in the ACT and live outside of the ACT we suggest you choose delivery to your workplace or order a pick-up from our Wanniassa store. All of these options are given during checkout. We will keep a $10 processing fee where we have to refund an out of zone PayPal order. We strive for 100% satisfaction for every customer of Jordo's Chop Shop, we are happy to refund 100% of the product price under the following conditions: A manufacturing or processing error on our part or if you are unsatisfied with the quality of our product. We will not refund any shipping or service charges (if any). We also require no less than 90% of the product must be returned to Jordo's Chop Shop, Wanniassa Shops, Sangster Pl WANNIASSA ACT 2903 AUSTRALIA with proof of purchase for a full refund. To arrange payment via credit card over the phone, please select Credit Card over the phone on check out, and we'll call you on the delivery day for payment. •if you would like 6 chicken kievs, type 6 into the qty box. •if you would like 600gm premium mince type 0.6 into the qty box and if you'd like 1.6kg, type 1.6 into the qty box. To view more info on a product and its multi-buy (bulk) special price, click on the products picture. Value pack swaps are swapped at full prices, this means you will get an accurate value swap on the product chosen. We will give your swapped out item it's full price value and swap it for your chosen items full price value. This way is fair and ensures you don't loose out if the the product that you are swapping out is on special and we don't loose out if your chosen item is on special as your whole pack is discounted to special prices regardless. If you have any trouble determining the type of product ($each or $kg) or any other areas of the site we should improve PLEASE LET US KNOW!, this will greatly help us develop our service. If you have any questions about your account or any other matter, please feel free to contact us at orders@jordoschopshop.com or by phone at (02) 6231 8755. We always prepare your products to your exact requirements, if we are unsure of your request we will contact you to clarify. We will always over-weigh your products (even better value) to make sure you get what you paid for, and then some. We will always avoid using excess packaging and re-use cartons given to us. As well as helping to reduce our costs, it's better for the environment. All orders are cut fresh right before they are delivered for maximum freshness and flavour (except Christmas week where we cut your order the day before). You can also see this on display in our Wanniassa store where you'll notice we don't have trays of steaks and chops on display because we cut everything fresh for you on the spot to your exact specifications to ensure you are are 100% satisfied.